We’re back to regular play. Will Ann Conger finally break us free from the carousel? Ann is our tenth consecutive one-day champion, but she’s in great position to grab a second win tonight. 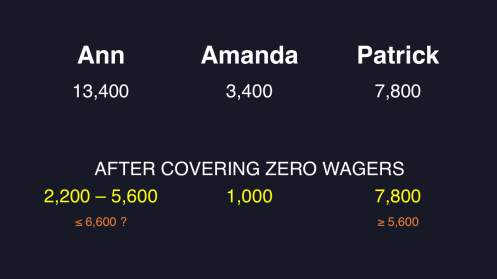 To cover an all-in wager by Patrick, Ann will need to wager 2,200. An incorrect response with that wager will leave Ann with 11,200. To stay above that total, Patrick will need to wager at least 3,400. Amanda is out of it, so she should focus her efforts on second place. 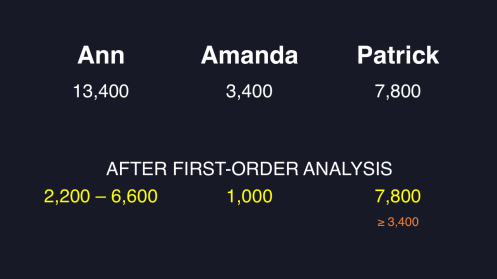 If Patrick misses with that bare-minimum wager, he’ll have 4,400, so Amanda should wager 1,000 and hope for a correct response. Now that ties are no longer allowed, the player in the lead can put more on the line in certain circumstances. This is one of those circumstances, because Ann has a crush (i.e., second-place Patrick has to get it right to have a chance to win). Ann will want to stay above a doubled-up score by Amanda, which means a maximum of 6,600. Ann and Patrick are separated by 5,600. Patrick should wager at least that (he should still go for everything, of course), and Ann could cap her wager at that amount to compel Patrick to respond correctly. If Patrick is anything resembling a rational wagerer, this shouldn’t be a huge concern. That 6,600 amount is definitely the most Ann can risk. Hey, now! Sionara, carousel. Ann goes for 3 tomorrow and an early claim to the next TOC roster, and I film a video not dominated by helicopters. And maybe – just maybe – we get a better Final Jeopardy! clue, for once. What is The Last Picture Show? That seems to me a weird analysis. I’ll show my own version; please tell me why I’m wrong. 1. Ann sees that Patrick could double up and reach 15,600. Thus Ann should bet at least 2,401 to beat him. She should not bet more than 5,599 (since that would make it possible for Amanda to tie or win). 2. Patrick sees that if Ann bets 2,401 and gets it wrong, she’ll have 10,999. Thus Patrick has two reasonable choices: bet at least 3,200 (to beat Ann if that happens) or bet no more than 999 (to stay above Amanda if she doubles up). In his seat I bet 3,200. 3. 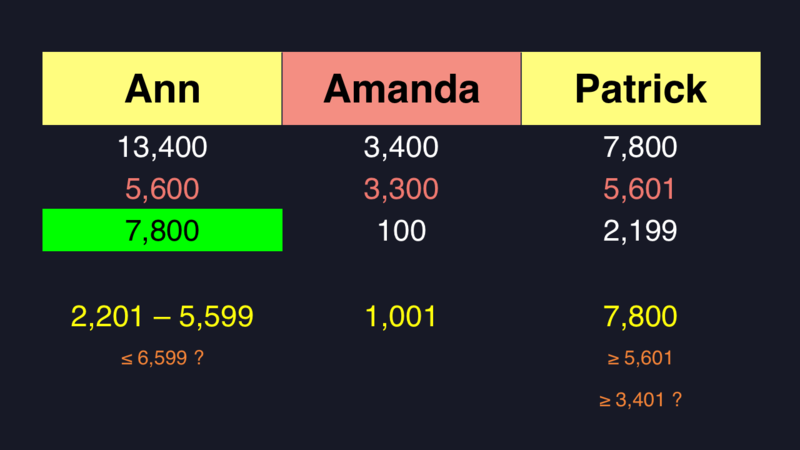 Amanda cannot get out of last place (assuming a rational wager by Ann) unless Patrick goes big, so assume he does. If he bets 3,200 and gets it wrong, he’ll have 4,600. Thus Amanda should bet 1,201. Ann’s minimum wager is 2,201. Since Patrick needs to get it right to have a shot to win, he should just wager everything. 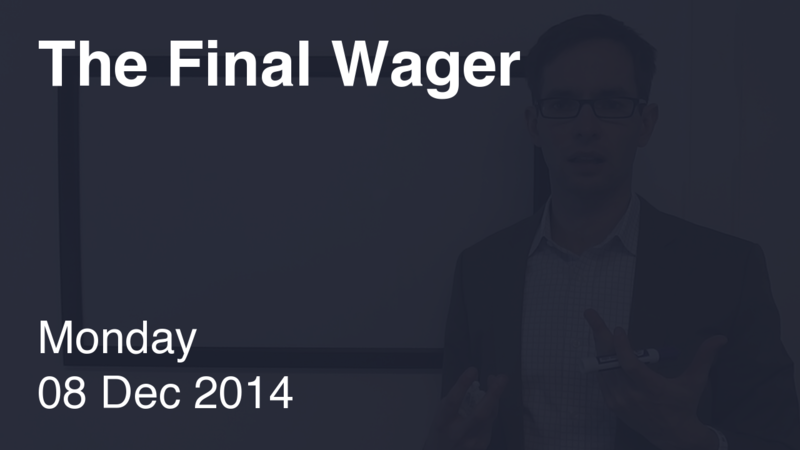 Wagering 999 doesn’t give him a chance against Ann’s minimum wager.